Yesterday rescuers were set to help a troubled killer whale find his family, but the orca had other plans. The underwater net pens were ready and a jet boat was primed to serve as a lure, but the star of the show — a stranded killer whale — wasn’t cooperating yesterday with his would-be Canadian captors. Luna headed out to sea off the northwest coast of Vancouver Island with a group of local Indians paddling dugout canoes. Native Canadians claiming a spiritual connection to the lonely orca lured him away in an attempt to prevent his capture — the first stage of a planned reunion with his Puget Sound relatives. So far, the protesters have succeeded. For months, U.S. and Canadian officials and scientists have been planning and preparing for the capture of the 4-year-old whale. The orca has grown increasingly chummy with people and boats, which he follows and even pushes around. Last week, Luna nearly collided with a seaplane. But members of the Mowachaht-Muchalaht band oppose the reunion strategy, convinced that Luna embodies the spirit of a chief who died around the same time the orca separated from his pod and wound up in remote Nootka Sound, three summers ago. 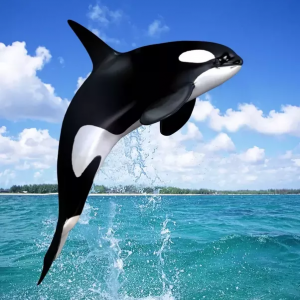 “That means a lot in that my late father expressed to a couple of members that he was going to come back as a killer whale,” said Mike Maquinna, chief of the Mowachaht First Nation. To block the capture, 17 men and women of the Mowachaht-Muchalaht band boarded two traditional canoes in Gold River near Nootka Sound yesterday morning. They managed to draw Luna about 12 miles away from where officials had hoped to trap him in a large net pen for a medical inspection. For much of the trip, Luna swam alongside, spinning over onto his back while some of the Indians patted his skin, rubbed his teeth and scratched his belly with hands and paddles. The decision to capture the whale was prompted by increasing concerns that he could be injured in his frequent human interactions, combined with the fact that his pod is precariously small. As long as Luna remains a loner, he remains out of a breeding pool that desperately needs more genetic diversity. The plan is to lure the orca into the holding pen using a jet boat that he likes to follow, apparently enjoying the rush of water across his face. Maquinna said the band may rotate new paddlers and supplies into the canoes to keep Luna at the mouth of the sound, near a traditional village and away from the pen. Officials with Fisheries and Oceans Canada, the agency overseeing the capture, said their team used the extra time caused by yesterday’s delay to make final preparations. Marilyn Joyce, marine mammal coordinator with the department, said she will be talking with Maquinna to try to address their concerns. The chief said the effort to thwart Luna’s capture was not meant as an act of civil disobedience, and Joyce said it would be up to her department’s enforcement division whether to make any arrests. A team of 25 orca experts have been assembled in Gold River to oversee and conduct the operation. It’s being led by the Vancouver Aquarium and scientists with Fisheries and Oceans, the U.S. National Marine Fisheries Service and independent experts. Most have predicted that the capture should go smoothly, posing little threat of harming the orca. “He seems to get along with people pretty well, so it’s not a serious risk,” said David Bain, an associate professor with the University of Washington who is a member of the project’s science advisory panel. “The transfer process is very well worked out now, and they’re hiring the best people in the business,” said Rich Osborne, director of The Whale Museum in Friday Harbor. The challenge is expected to come on the other end of the endeavor — getting Luna to re-bond with his family and leave people alone. “If he doesn’t pick up with his pod right away, he has a lot more boats to choose from compared to where he is now,” Bain said. Luna belongs to an extended family of orcas known as the L-pod that frequents the waters around the San Juan Islands. Concerns about the survival of the small population of local killer whales — which includes J, K and L pods — helped fuel the interest in reuniting Luna with his family. There were close to 100 local orcas in the mid-1990s, but that population slid below 80 in 2000. The population climbed to 83 last year. U.S. and Canadian governments each are spending about $100,000 on the Luna reunion effort, and there has been $44,000 in cash donations and more than $200,000 worth of in-kind donations. An additional $44,000 is needed, officials said. Luna, also known by his scientific designation L-98, will be held in Gold River for about a week once captured while he undergoes medical tests to check his health and make sure he doesn’t carry any diseases that could spread to his pod. Experts have said that he appears to be in good condition. Then he will be put into a sling and hoisted by a crane into a truck, by which he’ll travel more than 200 miles to Pedder Bay west of Victoria. Experts decided to move Luna by truck instead of boat because of fears of rough seas on the western Vancouver Island coastline. “Apparently whales can get sea sick,” said Fisheries and Oceans spokeswoman Lara Sloan. Luna will be transferred again to a net pen in Pedder Bay until his pod comes into auditory range, which is about 5 to 10 miles, depending on how much background noise is present. Orcas make sonar noises and chirps and whistles common to toothed whales, but also make screams or calls that are unique to killer whales, said Osborne, of The Whale Museum. Local orcas have about 35 sounds — screeches and moans — in their vocabulary. Each maternal group, which includes mothers and their offspring, has specific calls and sounds are shared within pods, Osborne said. The hope is that Luna will recognize their conversation as coming from his pod while it travels around the Strait of Juan de Fuca, the San Juan Islands and up around the mouth of the Fraser River and Georgia Strait. The animals swim about a hundred miles a day. Scientists and orca enthusiasts closely track the resident killer whales when they’re in inland waters, sharing information on the Orca Network. When the network observes Luna’s pod within range, the orca — which will be tagged so his movements can be tracked — will be released. The successful reunification of Springer in July 2002 gives the whale experts reason to be hopeful. The 2-year-old orca strayed from her pod and spent about six months hanging out around Vashon Island. When the orca showed signs of poor health and began interacting too much with boats, she was captured and released near Vancouver Island as her relatives swam nearby. Springer appears to have reconnected with the pod, which includes an aunt, grandmother and cousins, but not her mother. While Luna has been apart from his pod for about three years, experts think he could return successfully because his mother is still there. He also has a new sibling that he’s never met. AUTHOR: Lisa Stiffler The Associated Press and The Sun of Bremerton contributed to this report. P-I reporter Lisa Stiffler can be reached at 206-448-8042 or [email protected]. Lisa writes for the Seattle Post Intelligencer Reporter.